Hi I'm Bruce from South Africa... I named my Jack Tjop (like when you have a BBQ) as he has brown stain on his back leg resembling the shape... he is very smart and learns instantly... I love him to bits. I took my first loans when I was 20 and it helped my business very much. However, I require the financial loan again. Maggie from East London, SA. I am in the process of getting a new dog. 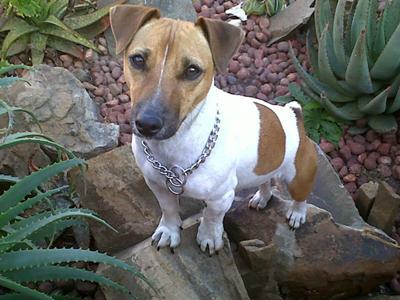 The animal shelter where I live has a Jack Russel (fixed female) that I am considering. My concern is she seems a little older, which is okay, but how do older terriers adjust to a new home and are they good watch dogs? Thank you for picking my tjoppie as Jack of the Month for August... he is one of a kind, I just got him a Scottie as a friend.